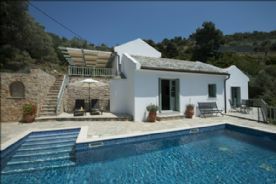 This beautiful Pelion roofed and chestnut beamed 3 bedroom property with swimming pool was built in 2008. 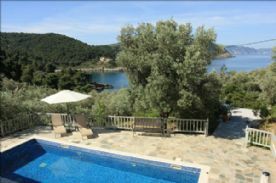 Aquilo is set in 5315sqm of mature olive grove on the west coast of Alonissos in an area known as Megali Ammos with stunning views out to sea and over towards Skopelos. 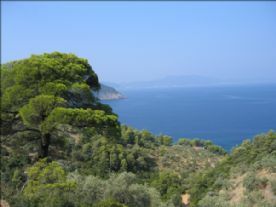 Aquilo is just six kilometres away from the port of Patitiri, a small graded track leads to a coastline covered in pine, olive and cypress trees. 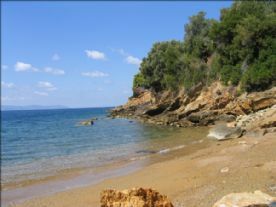 Aquilo provides a comfortable and peaceful retreat within 200m of a small sandy cove and a pebble beach. Entrance/Lobby area: 2m x 2m. 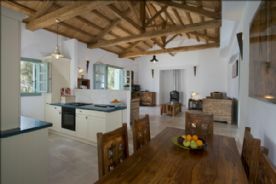 Kitchen/Dining area: 5m x 3m with modern kitchen appliances. Lounge Area: 5m x 4m, there is a 6kw wood burning stove with entire floor area of Aquilo being covered by natural tumbled marble tiles. 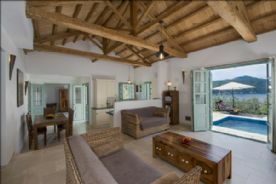 From the lounge there is a large French window that leads out towards the pool and the beautiful views beyond. Bedroom one (double) with en-suite: measures 4.0m x 5.1m. 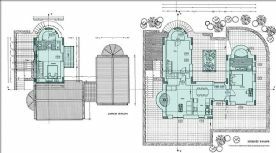 Double doors leading off the bedroom opens into the en-suite measuring 2m x 4m with an additional wet room shower area of 1.5m x 2.5m. 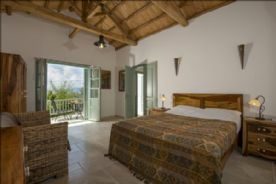 Bedroom two (double) with en-suite: this bedroom measures 4.0m x 4.5m and has the benefit of it’s own balcony overlooking the beautiful fragrant courtyard and over to the forested coastline. 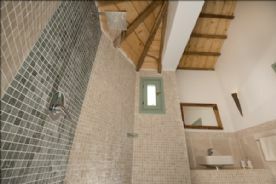 The en-suite carries the same dimensions and quality finishes as bedroom one. Bedroom 3 (twin) with en-suite: twin bedded room measures 4.0m x 3.5m. Leading off to through French doors with direct access to the courtyard. The en-suite carries the same dimensions and quality finishes as bedroom one and two. Up from the pool area there are the stone stairs that take you down to the Apothiki which is directly beneath the lounge area. Aquilo enjoys a courtyard and garden borders of oleanders, lavender, plumbego flowers complimented by apricot, lemon and almond trees. Ground cover includes sage, oregano and rosemary. 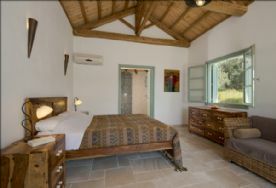 In summary this is a superbly maintained individual property, fully furnished with satellite TV connected.